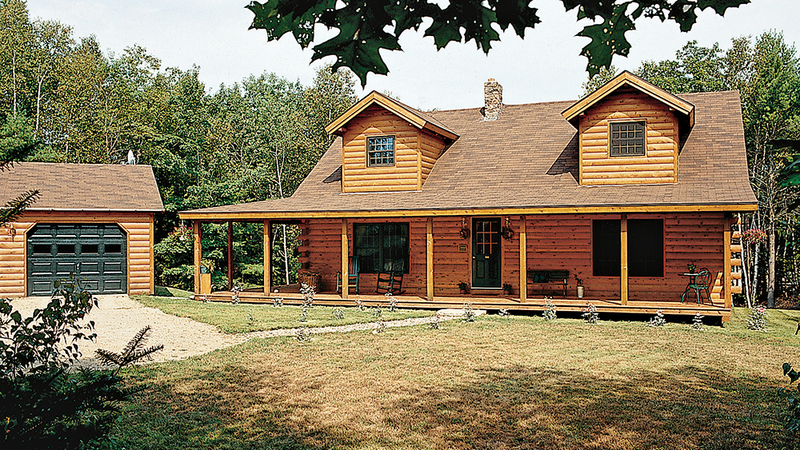 Log homes are classic — they’re the American architectural ideal. 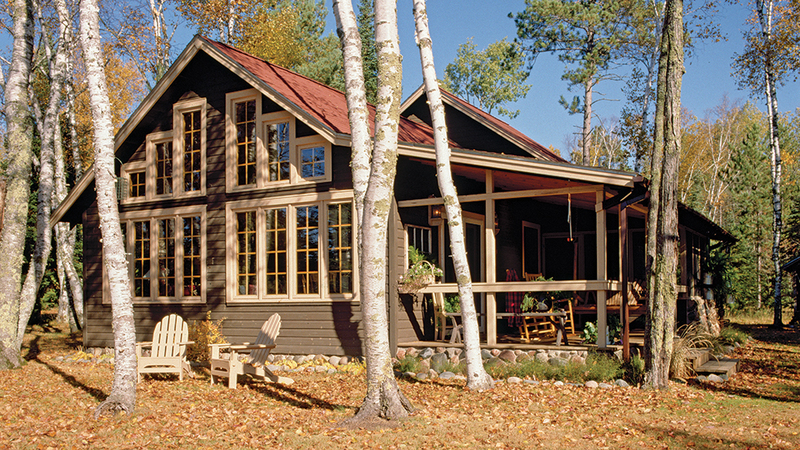 But even a structure as timeless as a log home goes through trends. Like fashion, the way we design and finish them alters through the years. Floor plans, stain choices, fixtures and fittings come in and out of favor as our needs and tastes change. But like a finely tailored suit, the fundamentals — the logs — remain relevant. And it’s not just the way they look. 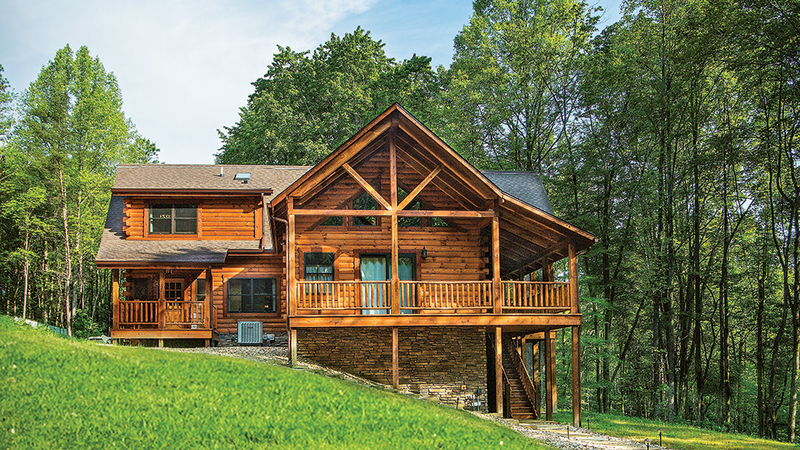 The industry, itself, has made structural improvements to make log homes even better than before. 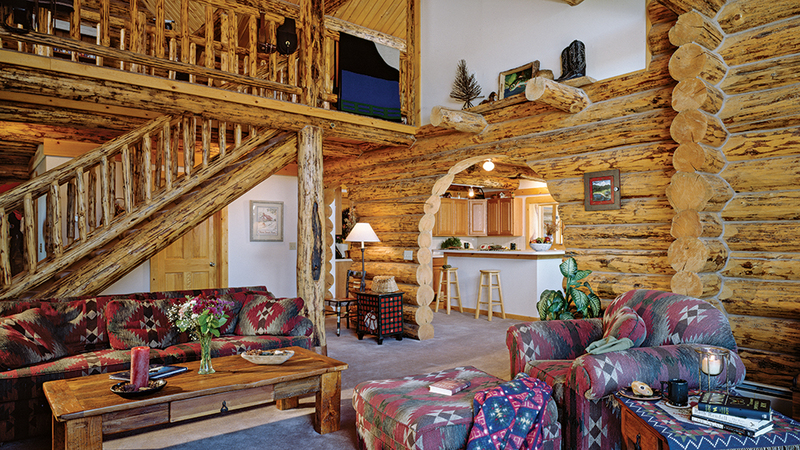 We thought it would be fun to take a look through our own “way-back machine” to see just how log home living has evolved over the past two decades. We hope you enjoy (and learn from) our stroll down memory lane. See also Exotic Wood Options: Are They Worth It? Just as home owners have learned a thing or two about design over the past two decades, so, too, have log home companies. 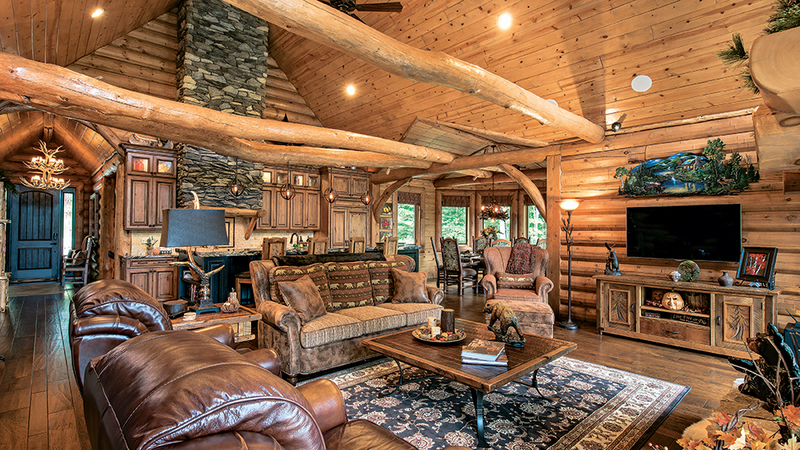 Featured in Log Home Living in 2001, this house doesn’t have adequate roof overhangs. The depth is too shallow to e ectively keep rain, snow and sunlight from attacking the log walls. Deep overhangs, a wide covered porch and good slope to the roof’s shed dormer better protect this home from the elements. In the process, the lucky owners have extended their outdoor enjoyment, come rain or shine. Back in 2002 when we featured this home, the kitchen was obviously necessary, but it wasn’t an integral component of the home’s entertainment space. The island is tiny, and little effort was placed to make the elements, like cabinetry and appliances, stand out. 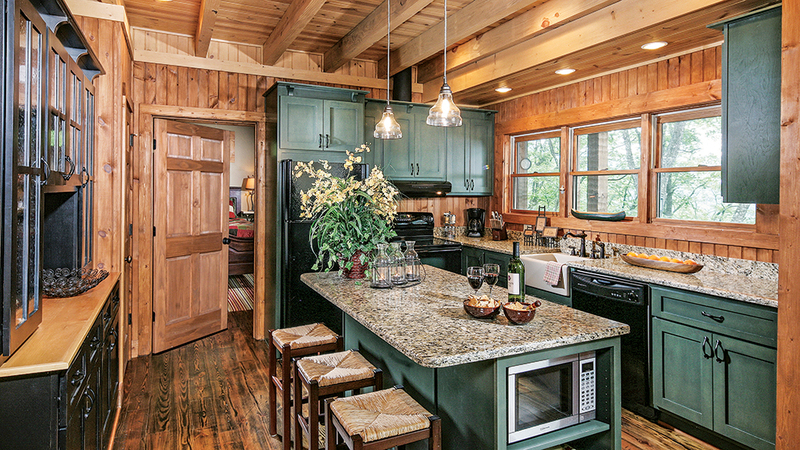 This modern log home kitchen is clearly the heart of the home. It embraces classic elements, like beamed ceilings and white cabinetry, but with higher-end finishes. The massive island, topped with thick, durable granite, is perfect for prepping food and serving guests. 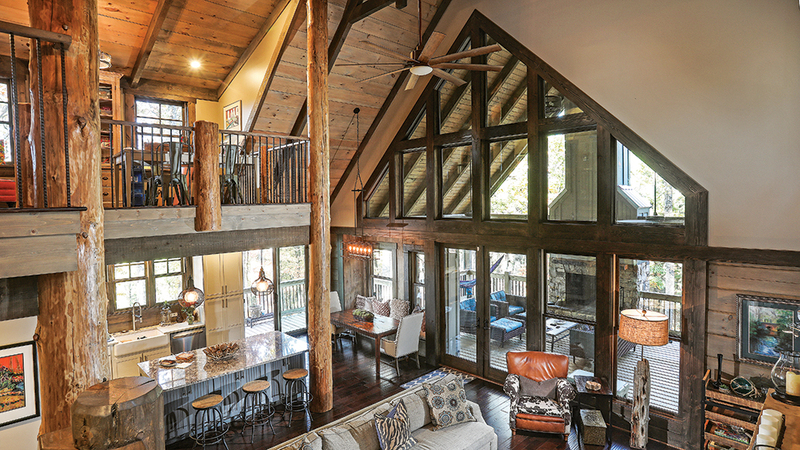 Oversized windows usher natural light in and wide-plank hardwood floors add rustic elegance. Two decades ago, it wasn’t uncommon to see undersized or unusually shaped windows in log homes, like these tiny dormer windows. The approach didn’t do much for a home’s curb appeal or allow enough natural light to enter the home. This home is awash in beauty and light. From the wall of glass looking out to the covered porch and outdoor fireplace, to the sliders in the dining room, to the casement windows above the kitchen sink (and in the loft), the house incorporates appropriately sized windows at every turn to glorious results. Though lovely, this house (originally featured in 1999) has one fatal flaw in regard to modern design — the main living area is not open to the kitchen. As attractive as the log archway is, it divides the space and keeps the resident chef from fully interacting with guests. Today’s approach to design is total open-concept integration, creating a true “great room.” There are no lines between living, cooking and dining spaces, and incredible care is taken to make them feel cohesive. 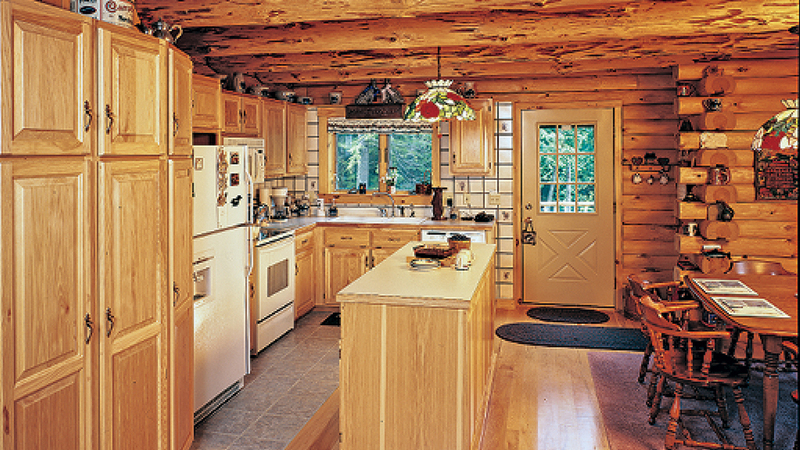 Twenty years ago, a lot of buyers thought owning a log home meant the design and fixtures needed to be quaint or old-fashioned to fit in. 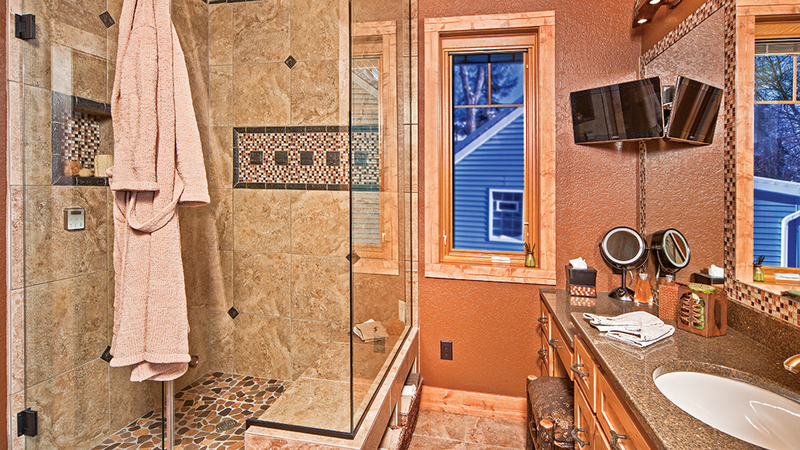 This bathroom, with its pull-chain toilet and small sink and vanity, is a prime example. 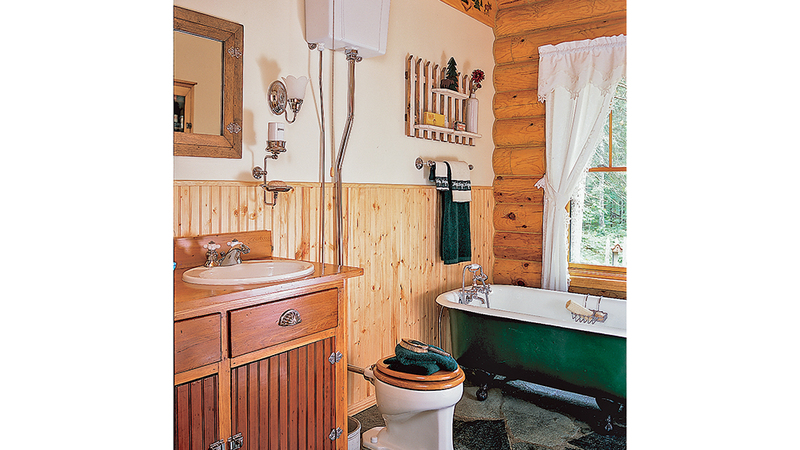 This log home bathroom received the spa treatment. A luxurious steam shower features modern tile and multiple showerheads, while an elongated vanity, complete with a seating area for makeup application, flanks it on the opposite wall. A built-in TV rounds out this lavish, tech-savvy lavatory. 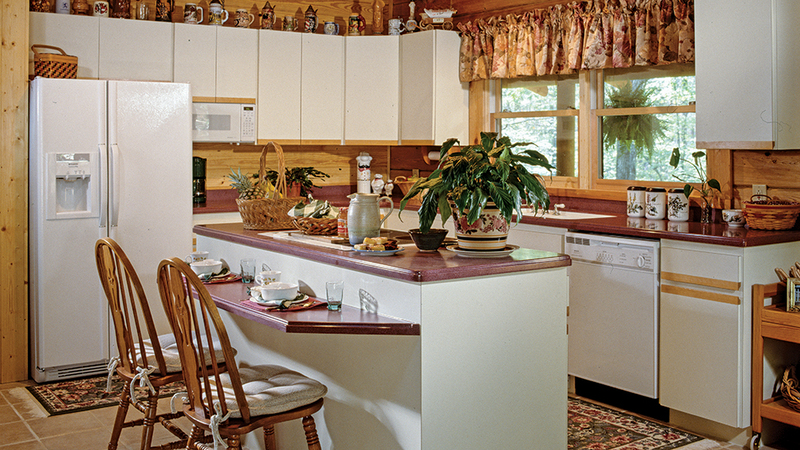 It wasn’t too far in the distant past when log home buyers thought that all the wood species and stain colors in their home, from the walls to the floor to the ceiling to the cabinetry, had to match — exactly. The monochromatic look was prevalent, but there is such a thing as too much of a good thing. 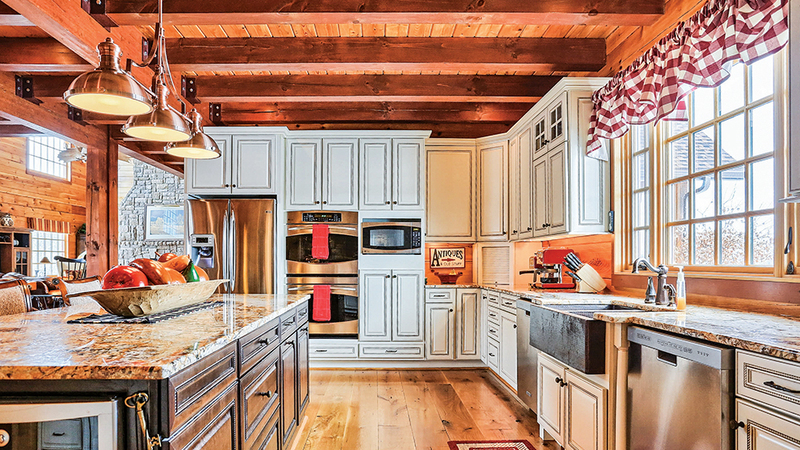 Wood-tone diversity reigns, and this kitchen is an exquisite example of how to do it right. The floors are a rich mocha stain, which complements medium-gold shade of the walls and the blond ceiling. The cabinetry is painted in not one but two colors: “Basil” and “Green Black” both by Sherwin Williams, and the hutch on the left is accented by a maple slab in a natural finish. Together, these elements create a timeless, more inviting space.